Not too crowded at this off-season exhibit. Lucky us. Well, that headline isn’t entirely true. Unlike some of the paintings on display, the three-man art show held last Sunday evening at a local church was not exactly invitation-only. However, not too many outsiders are likely to turn up at an art show in Dubois this time of year, as you can see from this picture I took the following Friday morning in the Cowboy Cafe. We’re hoping someday to see those tables just as occupied in the early spring as they will be a few months later, when we’re lucky to get a seat. That’s a good metaphor for the vision some local people have about the future of this equally beautiful valley. Things have turned down since the 2008 recession, but I think they’re looking up these days. This swan is one of four wildlife paintings by Beecham that will be featured this summer in the invitation-only Prix de West exhibition at the National Cowboy Heritage and Western Heritage Museum in Oklahoma City. All four (including a grizzly, a wolf, and a falcon) were on view last Sunday. This is the third year that Greg has sponsored an exhibition of works by local painters in April, the quietest month in Dubois. They call it a gift to the community. It’s a chance for us to see some of the best art by our neighbors, up close and personal, at at time when we’re not all going loopy trying to serve the needs of our visitors. Starting in about a month, the town will explode with returning “snowbirds,” many of whom are fine amateur or professional artists. But quite a few, like Greg, have chosen to live in Dubois year-round. He and his family have been here for 20 years. He told me that he and his wife Lu (who is the business manager for the local schools) “kept moving farther and farther away from the hubbub” in western Washington state two decades ago, but the hubbub kept chasing them. At a local art show in Ellensburg WA, he asked the husband of an artist from Casper where they could find a place in Wyoming that was not too crowded, had a good school for the kids, wasn’t too cold, and was beautiful. They looked first in Colorado, because his parents came from Grand Junction. But even back then, he said, there were still too many people in Colorado. So they detoured back through Dubois “to see if what the guy had said was true.” Within a few weeks, they had bought property in town. Last weekend’s art show also featured works by Jerry Antolik and Tom Lucas. Antolik lives in the tiny nearby hamlet of Hudson, where he focuses his efforts on murals. But his portraits are also excellent, and as you see here he also does fine wildlife paintings. Antolik told me he was up on Union Pass quietly working beside this pond full of lily pads when the moose suddenly emerged with her calf. Tom Lucas, who grew up nearby in Lander, is as much a historian as a painter. He’s well known locally for his monumental effort to research and recreate the methods by which the ancient Shoshone treated the horns of bighorn sheep, to craft the legendarily strong and supple bows that allowed them to be master hunters. One of his bows was on display last Sunday, along with several of his masterful paintings of native crafts. As part of learning to paint them, as you can see from the beaded bag in this picture, he also recreates them. Tom, whom I consider a good friend, told me he began to paint as a young lad because he was inspired by the work of Charlie Russell. “I never thought I could get to be that good,” he said, “and maybe I’m not.” But you can see how far he has come in that direction. He also said that he hoped the show might inspire the same dream for some of its young visitors. If it does, they’re in a good place to find living mentors. Recently, I had the unforgettable opportunity to help study some of the bighorn sheep and mule deer in the Dubois area, up close. It was an incredible experience! Along with several other volunteers, I assisted in a joint project of the National Bighorn Sheep Center, the University of Wyoming, and the state Game & Fish Department to monitor the body condition and migration patterns of these wonderful animals. Our job as volunteers was to help collect the sheep delivered by helicopter, and to protect both the biologists and the animals by holding them still while they were being examined. Last year, several ewes were collared in order to track their movements and recapture them annually for physical examinations. A helicopter crew from New Zealand was hired to capture the sheep and bring them to the exam area near Dubois. The crew used a helicopter and net gun to catch the sheep. Once the sheep were caught in the net, two muggers (yes, that is what they are called!) jumped from the helicopter to blindfold and hobble the sheep. They also wrapped them in a sturdy tarp for transport to the exam area. The helicopter pilot’s skills were impressive, to say the least! He very gently laid the sheep on the ground, where volunteers picked them up and carried them to the biologists who would examine them. Each animal had an extensive examination, which included measuring their body fat, checking for pregnancy using an ultrasound, and collecting blood, ear, nose, and throat swab samples to test them for disease. Most of the sheep were surprisingly calm throughout the process, especially considering that no tranquilizer was used. The collars were then adjusted or replaced as needed. After this, the sheep were moved to an open area, where their blindfolds and hobbles were removed and they were set free. Volunteers were also able to help with freeing the ewes. Once released, the ewes did not waste any time running to rejoin their herd. They are amazingly fast runners. The collars on the ewes allow the biologists to track them and their lambs throughout the year and to monitor their health as well as their migration patterns. As a new part of this ongoing statewide project, several mule deer in the Upper Wind River Valley have also been caught, examined, and collared with the same objective. I would not have imagined that I would ever be able to get so close to bighorn sheep or be able to actually help with a project like this. I hope that the long-term results from this research will help ensure the health of these magnificent animals, and increase their population. Want to see more of Living Dubois? Sign up at upper right to receive new posts by email. As I said nine days ago, Mother Nature messed with our heads on March 20, giving us a balmy First Day of Spring. Today, she got serious again. It was our third or fourth day of snow in a week. This time it was snow in earnest, inches of it, deep and soft, blowing sideways from the east. The dog was in ecstasy outside, leaping and rolling in the drifts. A gray cloud hung like a fluffy down blanket over our heads, all day . It’s spring break week, and down time in Dubois. The snowmobilers are gone. Many of the restaurants have closed for a few weeks. Even some hard-core full-timers have gone south, including fearless wilderness-loving Becki with her two children, off in search of the sun. However, in theory we’re not sorry to see more snow this spring, because it means runoff later that will help to grow hay, minimize the risk of fire, and make the valley beautifully green this summer. I stayed mostly inside, cleaning my desk and baking cookies, glad I didn’t have to go out to feed any horses or cattle. Yesterday, I realized it’s actually spring break. Over at Town Hall, several parents were in the Council chambers with their teenagers in the morning, having shown up for the monthly visit from WYDOT to help them sign up for drivers’ permits during school break. I had gone there to commence my divorce from New York and my marriage to Wyoming. It’s long past time to ditch that old photograph, taken way back when my own children were still children. But that’s hardly the most important reason to take this step! “You going away this week?” asked a man waiting in front of me in the Council chambers. I didn’t find them grouchy at all. Bureaucratic, sure, but generally pleasant–and understandably concerned about driving back home in the coming snowfall. Of course, the people waiting to be served had lived in a small town far too long to consider this actually a fairly enjoyable experience, as I did. I thought back to the day when I had that picture taken for my New York license. I had to turn up at the Brooklyn DMV by around 7 AM in order not to have to spend all day getting the job done. I stood in a long line in a featureless corridor and waited at least an hour on my feet before we were let into a huge room with fluorescent lights and long rows of plastic seats. The clerks behind the counter were truly surly. Nobody said anything unofficial, because we were all strangers. In which I discover the serene beauty of the Rez, the foreign territory next door. I needed to run some errands “down county” in Riverton, about an hour away. It was almost balmy spring, and a different experience altogether from the wintry drive over the mountain pass to Jackson a few weeks ago. I was driving alone. With no conversation to distract me, I had time to discover that this route has a serene beauty of its own. Almost all of the drive is on the Wind River Indian Reservation, home of the Eastern Shoshone and Northern Arapahoe people. This is not a desolate, barren desert of windblown sand, like the Hopi reservation we saw in Arizona last year. It’s as fertile as the rest of the valley. As you drive, you see cattle, horses, and lots of hay. I’ve met a few of these distant neighbors, but I don’t have any friends among them. “The Rez” feels like foreign territory, which I suppose it actually is. In Dubois, we maintain a cautiously respectful and distant regard for the people on the reservation. They do not hasten to engage us, for understandable reasons. The Shoshone knew this temperate valley from ancient times. For many generations, they migrated through it and occupied seasonal villages around here, long before their descendants were forced to settle here permanently. Their revered leader Chief Washakie and his advisors astutely negotiated the Wind River Valley as a reservation for their people 1868. The most prominent landmark on the drive is Crowheart Butte. You can see it in this picture, rising from the valley floor. I have no idea how the butte came to be on that flat plain, but nearly everyone here knows how it got its name. There’s no cellphone signal on the drive across The Rez, and radio coverage is spotty. I kept pushing the scan button and finally came across a strong signal. The melody was repetitive, supported by a drum. The lyrics were at once strange and familiar: Hey-ya-ya-ya. Hey-ya-ya-ya. The music carried me along for a few miles. I found myself imagining a woman standing in her kitchen, listening to the same music and looking at this austerely beautiful vista as she cooks. She is not a symbol or a character from geopolitical history. She is part of a real community that occupies this land as surely as I occupy our few acres, cooking her dinner as surely as I cook mine. Of course her tie to the valley that I have come to love would be vastly stronger than mine, who first saw it only a few decades ago. Maybe she appreciates this gold and blue landscape on a far deeper level than the way I enjoy the view out my own window, I thought. The DJ announced a new song, with a similar lilting melody and drum rhythm, but this one had words whose meaning I could understand. I don’t love you any more. I don’t need you any more. Her family isn’t locked up in the history I keep in my mind along with the images of petroglyphs and the sheep traps, I thought. Their culture evolves as ours does, but I will probably never know who they are. We slide past one another in Riverton or on the highway, aliens to each other for reasons still too deep to resolve. My mother, who grew up in Scottsbluff, Nebraska, often lamented the travesty our ancestors had done to the Native Americans. But I was a child growing up in the Midwest when she raised me. I never saw a Native American (to my knowledge), or a reservation. Her words meant almost nothing to me then. I understood them, but I did not. Gradually the road returning to Dubois begins to dip and rise, winding toward the striped and wrinkled backdrop of the badlands. It slides you gently around a huge curve, and then the other huge landmark suddenly rises in front of you: the red rocks. On a midsummer day, backed by a jewel-bright blue sky, they are even more arresting than this. They are the western end of this part of The Rez. Chief Washakie wisely insisted on holding onto these fabulous formations. On any of our long journeys back from somewhere farther to the east than Riverton, I see them as the finale. Beyond the red rocks, I am at home. The trip across the mountain pass is perhaps less of an adventure now, but still exhilarating. It’s barely light when we turn uphill to catch the 9 AM departure. In clear weather like this, we know, the drive will take about 90 minutes. The moon is still visible in the sky, and the road is silent. Plenty of our neighbors go over Togwotee Pass to Jackson all the time, for a shopping spree, to catch a ski lift or a show, or to visit a specialist. We rarely bother to head into that tourist hot spot, except to catch a flight. Still, the trip across the mountain is usually a delight–especially now that they’ve taken a little of it down to widen the highway. We used to approach road cuts like the one below with trepidation. The lanes were narrow, the plunge off the far side was steep, and you couldn’t see what was barreling down on you from the other direction. Especially on a wintry day like this, the drive could be pretty nerve-wracking. No more. Today, the highway is smooth, fast, and (as you see from the pictures) well cared-for even in the winter. We’re going all the way over the Continental Divide here, above 10,000 feet and back down. Thanks in large part to the interests of the snowmobilers, it’s going to be an easy trip today. The succession of vistas make you catch your breath, beginning with the monumental granite walls of the pinnacles, climbing to and passing across vast high mountain valleys, then drifting downward through a green tunnel of pines that open to views of the Tetons. This pleasure came at a price. Not long ago, we had to endure hour-long waits to cross miles of washboard gravel, while the huge orange toys moved big chunks of rock from here to there, scooped the gravel flat and frosted it with asphalt. Even back at home, we had nuisances to endure. Trucks burdened with boulders or tons of gravel would groan uphill past me as I finished my morning bike ride, and then growl noisily downhill using their jake-brakes on the way back down. The reward for our patience is a smooth, wide ribbon. Thank you, Albright Sand & Gravel and Oftedahl Construction. And thank heaven. The heavy equipment that goes up and down the road most often this time of year, other than the logging trucks, are the snowplows. We see them out even at times when it’s bone dry where we are–a welcome sign that the snowshoeing farther uphill is still good. In warmer months, this road becomes a scenic detour for those travelers who miss the turn at Moran Junction. Every so often a stranger pulls into our driveway and asks how far it is to Yellowstone. Told that the best option is to enjoy that same wonderful view again in the opposite direction for another hour or so, the driver often asks whether there’s another way around. In fact, there is. It’s a great trip via Thermopolis and Cody, through a memorably beautiful canyon. But it reaches the northeast entrance to the park, and takes the better part of a day. The driver’s next question: Is this a bed and breakfast? 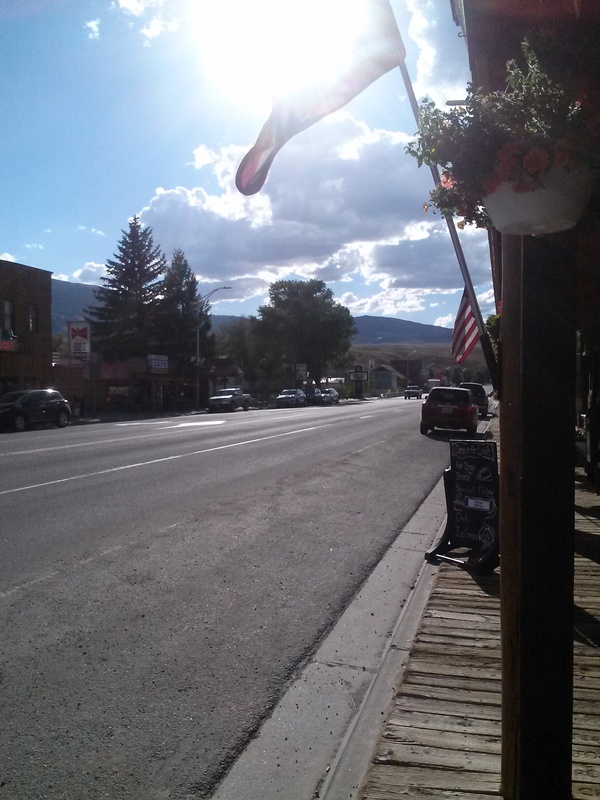 Again and again, people come to this remote town not far from Yellowstone and fall in love. How does this happen? You hear about it again and again: Someone came to this remote town not far from Yellowstone and fell in love. How does this happen? 1. Stunned by the scenery: A too well-kept secret. Granite peaks that rival the Grand Tetons for their splendor. The fascinating, slowly melting red desert. The quiet forests and mountain streams. The vistas never fail to astonish. 2. Seduced by the climate: The weather is most often pleasant and dry. The sun shines most of the time. Days are generally mild in winter, and cool in summer. 3. Fascinated by the history … and the prehistory. From the mysterious carvers of the petroglyphs to the courageous and resilient Mountain Men and homesteaders, the people of the past never fail to amaze. 4. Charmed by the people of the present: The welcoming instincts of Dubois’ townspeople and their impulse to help themselves and each other make it difficult to resist loving the whole community, once you get to know it. 5. Awed by the animals: The other beautiful residents of this valley appear unexpectedly, and leave you catching your breath in awe. You’d surely be poorer if you never saw an eagle fly–or watched an elk bound away, or glimpsed a mighty moose in the willows. 6. Healed by the hikes (or the horseback rides): Whatever the little misery that clouds your vision, it will vanish as soon as you can step outdoors, pause for a deep breath, and take the first few strides. 8. Romanced by the remoteness: It takes about an hour’s drive to find yourself in traffic or in a crowd. What does surround you? The beauty of nature, most of it accessible as public land. That said, there are plenty of good places to buy a meal or even an espresso. 9. In love with the location: Smack-dab in the middle of the great American West. It’s about an hour’s drive to Yellowstone in one direction and to a restored ghost town and gold mine in the other, stopping to visit Sacajawea’s grave on the reservation along the way. You’re a few days easy driving from Las Vegas, the Grand Canyon, Glacier National Park … I’ll stop there, for now. 10. Drawn to the artists: You may not be skilled at capturing what you see on canvas (or film), but so many others are. Plenty of them have not resisted the lure of living here, and you have ample opportunities to admire their work on display at art or photography shows, or in local galleries. 11. Overcome by events: Did you think there would be nothing to do out here in the middle of so much wilderness? I find I actually welcome a quiet evening at home, after last night’s lecture on animal migrations, the jam session the night before, my neighbor’s dinner party followed by cards, and on and on. I must be sure to be rested up before the Soupenanny next weekend! I’m so sad I was closed out of that free course on early Native American art and elected to miss the hike about animal prints in the snow. Thank heaven it’s still midwinter, when not much is going on. So many choices, so little time! 12. Beguiled by the benevolence: There are at least 30 nonprofit organizations in a town that has not quite 1000 residents, as of the last census. Nearly every event is a benefit for one cause or another, and when we run into a true crisis — a catastrophic fire in the middle of the business district, the threatened cancellation of our ambulance service — the way Dubois pulls together to rise and recover is almost beyond descriptions. 14. Finally, found by new friends: I heard someone recently describe meeting people in this town as like opening a box of chocolates and finding that they’re all truffles. Among the good friends I have met here are a nuclear physicist, a retired cowboy, a Parisian photographer, a Swedish schoolteacher-turned-wrangler, a great hairdresser (“Excuse me, where do you get your hair cut? Oh, Wyoming. Where’s that?”), a computer wizard, several lawyers and a dentist, numerous artists (of course), and a microbiologist. My hiking buddy grew up in Singapore and Pakistan. Our newest neighbors have moved here from Baton Rouge. So different, yet we all get along remarkably well. Why? We all share our love for this one remarkable place.